Here is a nice little ladies watch, sans bracelet at the moment. Movt is 6 3/4 x 8 6BO, an all Bulova design, interchangable with the 6BL, 6BA, etc. although the BA is slightly different size at 6 3/4x11. Two nicely cut little diamonds round off this lovely watch. 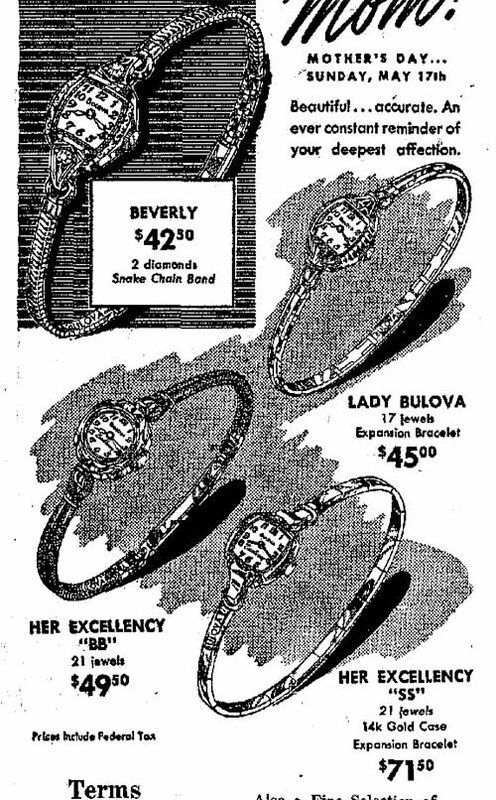 I was thinking Goddess of Time, there is an ad from 1956, but the jewel count is different. I will check my glass and plastic stock and see if I can help. I have a ton of ladies Bulova glass BB crystals so it is quite possible I may have what you want. I will try to let you know tomorrow (Sunday). Thanks John, but I think Darren has one, unless you have one with the Bulova model on it also....it would be good to have for future reference. Closest I can find is a 1951 Beverly...still looking. Good one, Stephen, I hadn't gone as far back as '51. I think it is a real contender. Yep, it even has the engraving. Beverly for me. No Geoff, that is the minutes track. If you look, you will see it goes all the way round, but when you get to the sides you can see the actual engraving. Looks like Beverly to me. wish the ad was clearer for my tired eyes.